It's back to the spring of 1982 and IPC's big launch: the revived EAGLE. 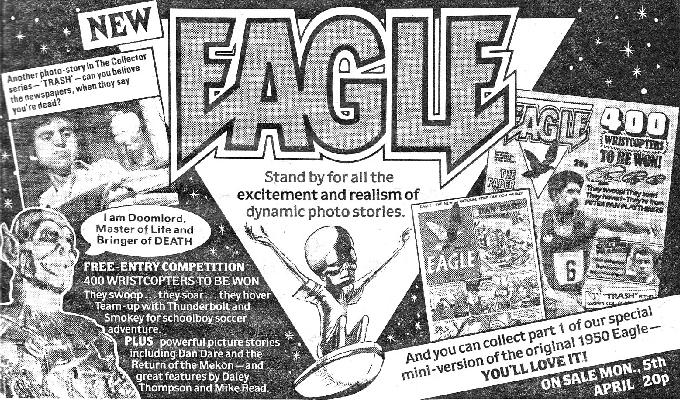 Last seen being devoured by LION in 1969 (although, predictably, the spin-off specials and annuals contented to appear well into the next decade), this mix of the old (a more-faithful-than-Tharg's reinterpretation of DAN DARE) and the new (photo-stories, an idea purloined from IPC's teen girls department and intended to counter the distractions of TV and video games) was clearly a bigger priority for the massive publisher than some of its other here-today, gone-tomorrow punts. The pricy-to-produce photo-strips, along with the better printing required to make them work, didn't last long (the last issue in the original format was cover-dated 17 September 1983) but the comic itself continued (although, towards the end, it dropped to a cancellation-dodging monthly schedule and largely consisted of reprints) until 1994, making it (almost) last-man-standing in IPC/ Fleetway's once booming comics group. 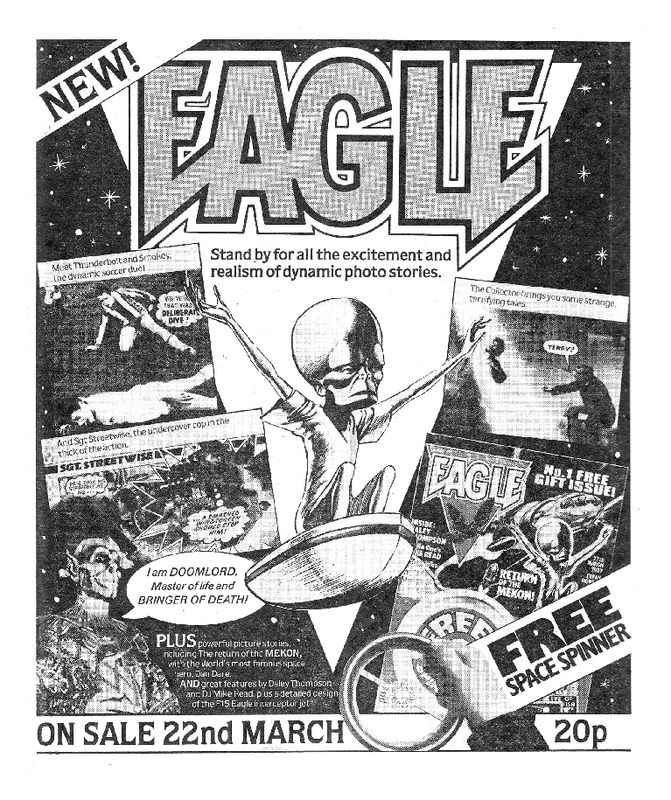 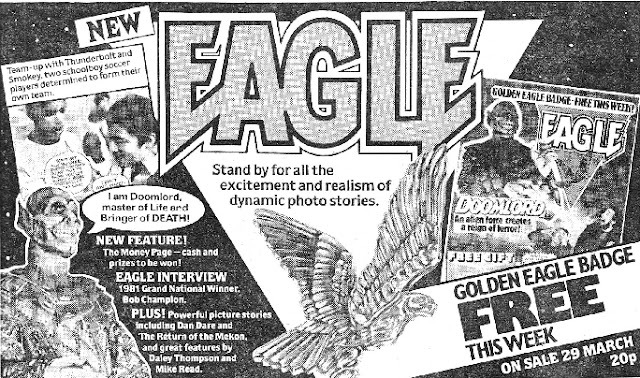 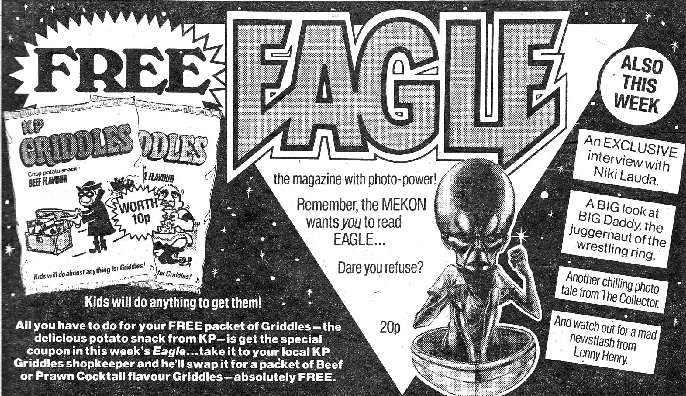 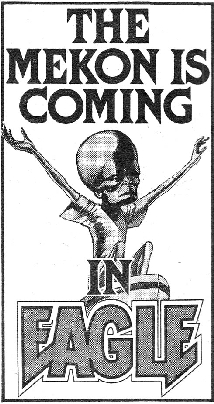 I've covered the first 18-odd months of the Eagle in earlier posts, and I've got provisional plans (IE I acquired a bunch of back issues a while back) to extend that coverage into the newsprint era, but these are a series of house ads that appeared in other IPC weeklies around the time of the relaunch, beginning with this small teaser ad which first appeared in IPC boys comics dated 6 March 1982.